Below is a smoking gun document that is bound to receive substantial attention at the up and coming Royal Commission into unions because it nails Maurice and Blackburn Lawyers and their then CEO John Cain Jnr. for their role in covering-up the Julia Gillard – Bruce Wilson AWU fraud. With the Royal Commission into Unions being formally signed off on Friday (14/3/14) and announcing it will hold its first hearing on the 9th of April (Click here to read) it is worth looking at one of many side players who has a lot to worry about. Much has been written about the main players in the AWU fraud such as Julia Gillard and Bruce Wilson etc but very little focus has been about the dozens of people involved in covering up the corruption. Former Australian Prime Minister Julia Gillard helped her former boyfriend Bruce Wilson rip off the Australian Workers Union (AWU) in the early 1990’s. Bruce Wilson worked at the AWU and set up many different bank accounts to steal money from the AWU. One of those accounts is listed on the document below and was called the “Australian Workers Union Welfare Account” which was held at the Commonwealth Bank. 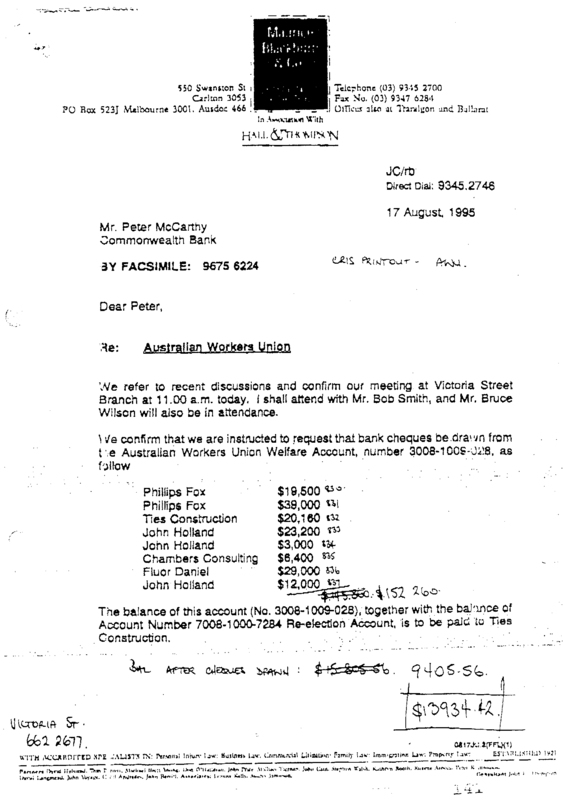 Bruce Wilson and others were resigning (being sacked for fraud and theft) from the AWU on the 18th of August 1995 and the document below relates to what happened on the day before on the 17th of August 1995. There was a meeting at the Commonwealth Bank to split up the stolen funds and return some of the money to the companies where the money was stolen from. At the meeting were John Cain, the bank manager Peter McCarthy and representing the AWU were Bruce Wilson and Bob Smith. The name Jim Collins from the AWU also shows up on Cambridge’s affidavit as having some involvement. I copied the document from the Federal Court of Australia in December 2012 when I inspected the files in relation to the Gillard / AWU fraud. It shows money which was fraudulently gained from companies by Bruce Wilson being returned to those same companies. 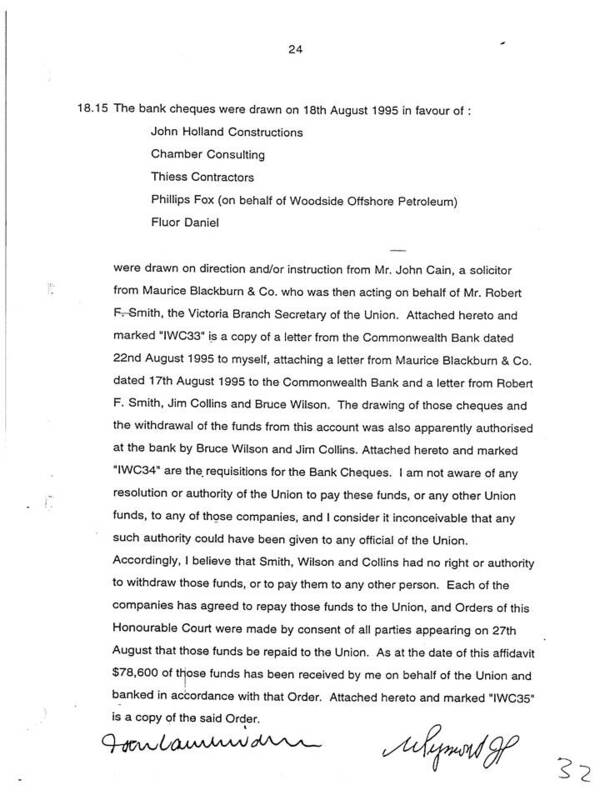 The document also shows John Cain, who was the CEO of Maurice Blackburn Lawyers from 1991 to 2002, instructing the bank a manager at the Commonwealth Bank what cheques needed to be written to cover-up the fraud and theft. John Cain had to know exactly what was happening and why the money was being returned to the companies. He also had to have known that Ian Cambridge was investigating fraud at the AWU. 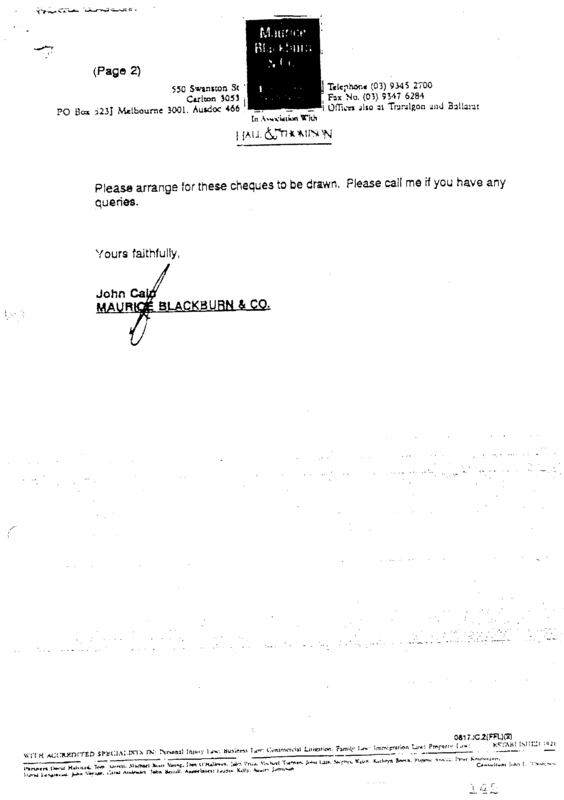 In Ian Cambridge’s affidavit John Cain and Maurice Blackburn lawyers get a regular workout from start to finish and he raises the above issue a number of times. Two of those being page 24 and paragraph 58 on page 40 which are below. The obvious question that has been on my mind for a long time is: Why are the Victoria Police not in possession of a copy of the Maurice and Blackburn file given the great lengths they went to get a copy of the Slater and Gordon file? Have the Victoria Police been playing favourites and trying to protect the likes of John Cain? In Victorian Labor Party politics John Cain is royalty given his father and grandfather were both Victorian Premiers. And they would have plenty of connections to call in favours to save themselves and their reputations. John Cain will have to sing like a Canary at the Royal Commission as it is my understanding there is no attorney-client privilege at Royal Commissions. Even if there was attorney-client privilege at the RC then the crime-fraud exception rule would apply as John Cain was helping his clients commit the crime of fraud and theft from the AWU so there would still be no attorney-client privilege. The above is only a very small amount of evidence, although very powerful evidence, focused on one person. So if the Royal Commission does it’s job properly the Australian public are about to get a very powerful show. ← Australia’s new export. Corruption! 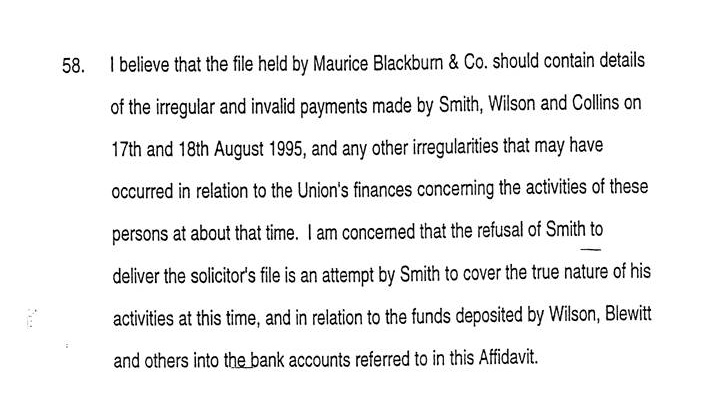 There is no doubt that Maurice and Blackburn were criminally involved in the cover up in Bruce Wilson’s Victorian frauds and what I believe were illegal redundancy payments to Bruce Wilson and others who resigned in August 1995. John Cain jnr was doing his best to keep everything quiet by covering up the full extent of Wilson’s Victorian frauds, so others like Ian Cambridge wouldn’t know the full extent of it. Cain jnr has plenty of questions to answer at this Royal Commission where I believe his personal reputation is on the line. I believe the Victorian police haven’t investigated Maurice and Blackburn’s involvement, and they are not playing favorites, actually I believe the documents involving Cain jnr will get the police’s attention and certainly the Royal Commission’s attention too. Also Bernard Murphy started work at Maurice and Blackburn in late 1995/early to mid 1996 after being sacked by Slater & Gordon for being a knowing participant in the AWU fraud. Why in the hell that Cain jnr hired Murphy in the first place? Was it a favor or just an another cover up? The Royal Commission needs to also investigate Maurice and Blackburn’s appointment of Bernard Murphy as well. Cain jnr is in plenty of trouble indeed in this Royal Commission. Thanks Shane for this enlightening information. The Royal Commission could have a field day with a few Legal Companies! You started all this of years ago Shane, do you think you will be asked to assist in these investigations? It seems to me, that just in all the information of Kangaroo Court of Australia, a Commissioner would be flat out to sort out, just what you have discovered. That maybe just the tip of the ice-berg? I am pleased that Mr Abbott kept his word, he indicated a judiciary Inquiry but has given us a Royal Commission, I do not think he has any idea, what he has started! They haven’t asked for assistance yet. Whether they will in the future who knows.